New device is all but confirmed, but will it come to the UK? Zune ready to take on the iPod touch? 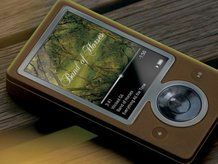 Microsoft's Zune might have never managed to make it across the water, but that hasn't stopped the Redmond group apparently refreshing the device with touchscreen goodness. Those chaps over at Neowin have managed to bag what they are claiming as 'confirmed' specs for the forthcoming device, including a mighty pretty 3.6-inch OLED touch screen. Lest we forget that Apple is rumoured to be using the same style of display in its forthcoming iPhone and iPod touch refresh, so Microsoft looks like it's trying to steal a march on its rival. Other unconfirmed rumours from the Microsoft inside state that the device will also have a camera, 3D Xbox support and even elements of Windows 7, although the last one is slightly unbelievable as that would mean the Zune HD was practically a phone and that's never going to happen. 3.6 inch-ish OLED full touch screen. 4GB, 8GB, 16GB and 32GB versions. HDMI Connection to stream straight to your TV. Wi-Fi compatible, with wireless marketplace. International release of the Zune device itself. Home AV packs, Car packs, Charge packs. We'll wait and see if this device ever makes it into the light of day, especially as there are rumours this will be the last ever Zune and it will instead become a mobile phone software platform, but for now we can all lust over a shiny new addition to the PMP world.